It long has been a nightmare for patients. It also likely affects patients’ health, and how happy the public is with hospital care. So why do hospitals make it so difficult for the already sick to get a good night’s rest? Some hospitals in Connecticut, however, are blazing a trail for quiet, lights out, coordinated night care, and other measures to boost the prospect that their charges get healing sleep. There’s no question that sleep matters for recovery and health. Patients who don’t get enough sleep heal more slowly, have decreased immunity and pain tolerance, higher rates of anxiety, and are more likely to suffer from confusion and delirium. Hospitals nationally are also waking up to the need to prioritize patient sleep as part of the broader shift toward patient-centered care, and also because of a federal program that penalizes hospitals for substandard performance scores in patient surveys. For institutions like Yale-New Haven, Hartford, and Stamford hospitals, the push for patient somnolence has been harder than it might seem. 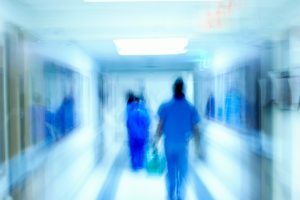 Doctors and nurses needed retraining and reminding to coordinate their rounds, to avoid loud conversations in halls and at stations, and to reassure patients that they were getting different but still needed attention when caregivers didn’t constantly check on them several times in the night. The hospitals had to figure how to lower lights on floors, cushion halls from clattering carts, and reduce incessant calls and pages on public address systems. Key support areas, including catering and medical labs, had to recalibrate their staffing and schedules. Experts had to determine which electronic alarms on medical equipment were critical, and which might be turned down or shut off. They had to determine how to get hard-of-hearing patients to turn down room televisions. And they changed their visiting hours, asking friends and families to leave earlier. These all are the kinds of steps that critics have called on hospitals to take, because sleepless and exhausted patients can be very grumpy. With patient satisfaction a premium concern for federal regulators and hospital administrators, restful sleep has risen as a key issue to be dealt with. people struggle to get it, I find the Connecticut hospitals’ efforts commendable and worth watching. It’s a big signal that these institutions got it straight that they needed to put their patients’ needs ahead of hospital schedules and the convenience and accustomed orderliness of the lives of doctors and nurses. Many cases I see with patients seeking justice with malpractice lawsuits in the civil justice system could have been averted with a relentless focus on patients first.